Volunteers are the key to having an effective student ministry. A student ministry will not last long with a single student pastor; it needs a committed group of volunteers as well. Currently I am in search of some new volunteers in our ministry. We have growing small groups, which means we need more volunteer leaders! Many student pastors are in the same boat I am, on the hunt for more volunteers. I want to share a view thoughts on selecting new volunteers that I hope will help you as you look for new people to add to your team. Don’t post an ad. The last thing you want to do is post a “volunteers needed” in your churches bulletin or website. If you do this, you will get a ton of responses from people that may not be close to what you are looking for. You’re opening up yourself to too big of an audience. However, if you do open it up so people can “apply” to be volunteers, make sure they know it’s not something you offer to everyone that signs up. For example, we just did a serve push for our whole congregation. We encouraged everyone to find a place to serve in our church and put together a webpage for them to fill out areas they are interested in serving. I had multiple people express interest in working with students, but that doesn’t mean they will get that opportunity. 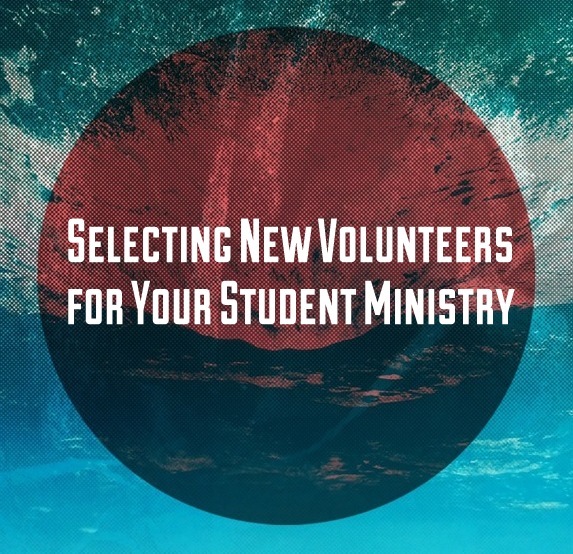 We want to get the right people for the job when we think about volunteers in student ministry. Intentionally search. Instead of posting an ad, I encourage you to intentionally seek out new volunteers within your congregation. Through relationships and community, look for potential volunteers that would be a good fit for your team. As I meet new people in our church I am always thinking in the back of my head if they would be a good fit for our student ministry. It wouldn’t hurt to always have that in the back of your head as well as you meet new people. Be open to recommendations from your current volunteers. Some of the best people to recommend new volunteers are your current volunteers. Many times they will know people that have an interest in serving students in your ministry. Usually they know a current volunteer and have seen what they have been doing which gives them an idea if it is something they would like to do. Encourage your current volunteers to always be on the lookout for new volunteers. These are just a few random thoughts on selecting new volunteers. Finding the right people for your team is important so take your time and get the right people. Don’t forget who is really in control when it comes to finding new volunteers. God will direct your path and will bring you the right people at the right time. Trust Him and do your best to follow His guidance as you look for new volunteers. The first thing I do is ask my current volunteers who they might recommend. Helping a new volunteer to feel like a part of the team is crucial, and it’s much easier if they are already known and liked by other volunteers. Good point! I am currently striving to bring more of a community “feel” to our volunteer team. Thanks for leaving a few thoughts! I like to look for new volunteers like a football coach scouts for players. It’s being intentional, asking around, noticing people on the patio and how they interact with students at church. If you notice redeeming qualities you then try to get them to serve on your team. Some leaders will come naturally but many people just need to be sought after and asked because it never has really occurred to them they would be “good” at student ministry. I got 4 new small group leaders this year doing this. It worked, at least for me. Thought I’d share it. Great thoughts! I really like the idea of gathering new volunteers that way. Thanks for stopping by and sharing!